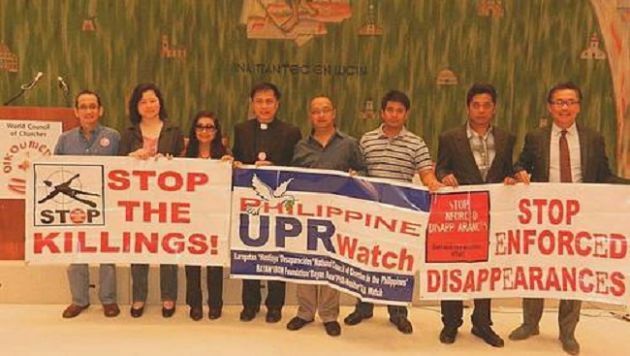 (Photo: World Council of Churches)Activists hold up signs at a public hearing on “human rights violations in the Philippines” hosted by the World Council of Churches at the Ecumenical Centre in Geneva on May 30, 2012. A Catholic Church-based election watchdog has criticized the Philippine government's plan to indefinitely postpone village polls originally scheduled for October last year. The election of the country's village leaders was originally scheduled for Oct. 31, 2016, but President Rodrigo Duterte postponed them to October this year. Now Duterte has said he wants the polls postponed indefinitely and leaders appointed due what he says is the influence of drug money in local politics, UCAN news reports. The move, however, drew the ire of election observers. "There is no substitute to periodic elections in a democracy to check the accountability of elected officials [and] to get a fresh mandate," said Rene Sarmiento, chairman of the Parish Pastoral Council for Responsible Voting. The National Movement for Free Elections also raised concerns. "Postponing elections undermine a democratic process instituted to ensure every individual citizen's right to choose their leaders and make them accountable," said Eric Alvia, secretary-general of the movement. Sarmiento said village polls could only be postponed "for legitimate reasons." In another sign of the rift between the Catholic Church and Duterte's administration the church has turned down an invitation from the Philippines national police to become part of the president's murderous campaign against drug dealers, the Irish Catholic reported. Following a call, issued by police chief General Ronald dela Rosa, the Filipino bishops' conference insisted that it supports "whatever strategy there is, for as long as there's no killing and it is devoid of any corrupt and unjust practice." The Irish Catholic reported that after months of controversy and some 7,000 deaths, the anti-drugs clampdown launched by Duterte was halted temporarily at the end of January. This followed accusations of extra-judicial killings and of corrupt practices on the part of the police, some of whom, it faced accusations of engaging in kidnapping and extortion under the cover afforded by the campaign. Now seeking to re-launch the initiative, General dela Rosa suggested that if priests were to accompany police on drugs raids, it was more likely suspects would surrender and not resist officers. Police often cite the message that many of those thousands of deaths occurred when people were resisting arrest, something disputed by many eyewitness accounts. The drug war became a national issue in 2016 when newly-elected Duterte pledged to end the menace by killing the leaders of drug cartels and their protectors.